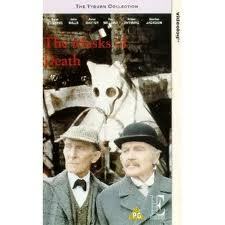 One of the better made for TV movies that star our intrepid heroes Holmes and Watson is “Sherlock Holmes and the Masks of Death. While Peter Cushing was no stranger to the part of Sherlock (he had made one other film and the 1968 TV series) John Mills was new to the role of Watson. In the story Holmes comes out of retirement to help Inspector MacDonald of Scotland Yard with one more case, but is interrupted by the Home Secretary (Ray Milland) and asked to take another case. Of course, the two cases turn out to be one and the same and Holmes (although older) with Watson’s help is up to the task of solving the mystery of three apparently unrelated deaths and the disappearance of a German prince. Cushing , of course, gives the usual workmanlike effort to Sherlock. He is totally believable in the part. And Mills does a superb job as Watson. While of a retirement age he is still quick witted, energetic and “a conduit of light” to Holmes. He is one of the most intelligently played Watsons in film anywhere. Anne Baxter plays an older, widowed, Irene Adler Norton and is exactly how you would like to picture the lady of mature years. She can still give Holmes a run for his money. (Although how she could not recognize him in his disguise at the train station is a mystery in itself.) Whoever did the casting for this 72 minute little movie did a fine job. Cushing and Mills played so well off each other I wish they could have made more. It’s just an entertaining film. John Mills is possibly one of the most famous actors of all time, with 129 movie and TV credits to his name not to mention legitimate stage and time as a song and dance man. Born Lewis Ernest Watts Mills in Norfolk, England in 1908 he stated that his earliest memories were wanting to be an actor. He never wanted to be anything else. The Oscar winner’s career spanned eight decades. He initially trained as a dancer and he first appeared on stage professionally as a chorus boy in “The Five O’Clock Revue” in London in 1929. By 1932 he was doing revues, legitimate theater and movies. In fact he did 19 movies before WWII interrupted. Mills served 18 months in the Royal Engineers but was put out on a medical discharge. He went on to play the role of military man in more than a third of his movies in the years to come. In fact his military parts are probably what he is best known for. His Oscar came playing the part of a completely different type character. In fact his role in “Ryan’s Daughter” had not one line of dialogue, the character was a mute village idiot. Mills was married to his second wife, Mary Hayley Bell for 64 years. She died a few months after John in 2005. John Mills also have famous children; the actresses Juliet Mills, Hayley Mills and writer/producer Jonathan Mills. John Mills was knighted in 1976. This entry was posted in Afghanistan, Doyle, Holmes, Uncategorized, Watson. Bookmark the permalink.